A lot of people including the Penangites aren’t really aware that there is a small aquarium located in Batu Maung, Penang Island. Even though the aquarium is small, if you live in Penang and like aquatic life, you could probably pay a visit to this place and you might like some of the fish there. I was actually sort of surprised to know there is this small aquarium located in Batu Maung, Penang. I won’t know if my friend in Penang hadn’t told me about it. The entrance to the aquarium within the Fisheries Research Institute. By comparing to the Aquaria KLCC and Underwater World Langkawi, the Penang aquarium is very small and there are far less aquatic species in this aquarium but you will get a more up-close and personal experience since this place is hardly packed even during peak seasons. You can take all the time you have to see all the fishes. The admission fee is only RM5 per person which to me is quite a bargain. A cute and shy puffer fish. 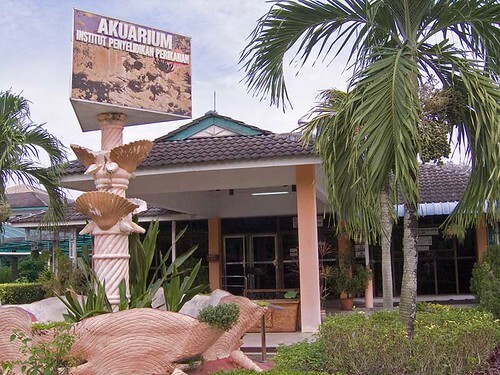 The aquarium is located within the Fisheries Research Institute (FRI) (Akuarium Institut Penyelidikan Perikanan) which is a government based research institute. Even though it’s a small aquarium, it has quite a number of fish tanks and there are actually quite a lot of species of fish and you will notice some very weird sea creatures. There is also a 80,000-litre tank housing several species of larger sized aquatic life. The aquarium has some really cool fish such as this baby sharks. Besides, there is a koi pond outside the aquarium. You are allowed to feed the koi fish and the turtles, but only with certain food provided by the aquarium staffs. It’s really fun seeing the turtles and the koi fish feeding in the pond. There are also quite a number of display of coral reefs. I am not talking about the dead one, you could see some live coral reefs moving their tentacles around in tanks. If you want to know more about coral reefs, this place is for you. There are lots of articles explaining in depth about coral reefs. Overall, it was quite an informative trip for me. 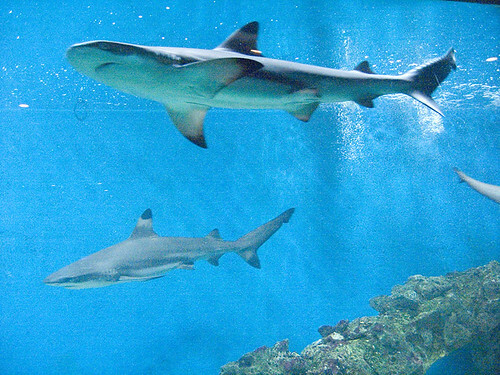 The aquarium is a great place for a short or a day trip. If you are looking for something fun and short to spend time with family, the Batu Maung Fisheries Research Institute will be a great place for both parents and kids. It’s an excellent family trip especially for kids and children. I am sure they will love feeding the koi fish and turtles. They will learn to appreciate nature, ocean and fishes. I believe it will be a great learning experience for them. 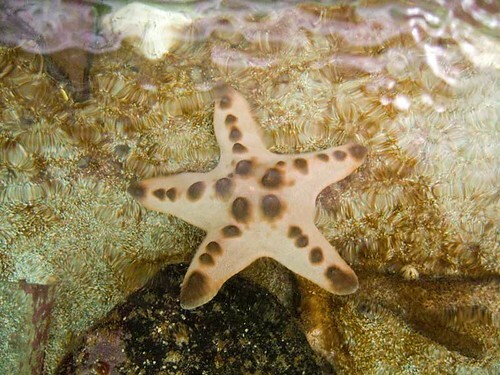 Besides, visitors are allowed to touch and play with some of the star fish and coral reefs there. You get to see the star fish and corals up close and feel them with your hands. You can actually touch and play with this star fish at the aquarium. Overall, the place is affordable to visit and yet fun to spend time at. Don’t parents get tired of going to shopping malls all the time? For more pictures of Penang aquarium, please visit the following flickr photostream. Esplanade – The Esplanade is not just a popular tourist attraction in Penang but also a historic place that tells you everything about Penang, including the history of how Penang transformed from a swampy frontier, to a bustling trading post, to the present day modern city. Cheong Fatt Tze Mansion – Featuring 18th and 19th century Chinese architecture, this stately mansion comprises beautiful bedrooms, libraries, ceremonial halls, courtyards and gardens. It also houses a rare porcelain collection, sculptures, carvings, tapestries, embroideries and antiques. Khoo Kongsi – One of five clan houses still standing in Georgetown, the Khoo Kongsi clan house takes on a remarkable resemblance to a mini clan village. One of the grandest clan houses in Penang, the Khoo Kongsi features tall thin columns supporting a gently sloping, red tiled roof, topped with carvings of dragons, phoenixes, mythical animals and various scenes from popular Chinese legends. Gurney Drive – A favorite haunt for food enthusiasts, this coastal road is famous for hawker foodstalls and restaurants offering a mouth-watering selection of Penang specialties such as asam laksa, hokkien mee, chee cheong fun, pasembor, rojak and various other delicious local delicacies. Kuan Yin Temple (Goddess of Mercy Temple) – The Goddess of Mercy Temple, or Kuan Yin Temple, is the first temple ever built in Georgetown, Penang, by Chinese settlers. The temple honours Kuan Yin, a devout Buddhist who was said to have attained the coveted state of Nirvana but had chosen instead to remain on earth in order to provide guidance and help to those who are themselves striving to reach Nirvana. The temple interior is usually filled with the scent of sandalwood incense, burnt by devotees who visit the temple to pray and seek guidance from Kuan Yin. Penang Hill – Penang Hill is one of the oldest colonial hill station established by the British during their time in Malaysia. Explored in the late 18th century, a horse trail was cut by the Waterfall Gardens (present day Penang Botanic Gardens) to the summit of the hilly spine of Penang, allowing the British to escape from the chaos of George Town to the cooler climate on the hill. 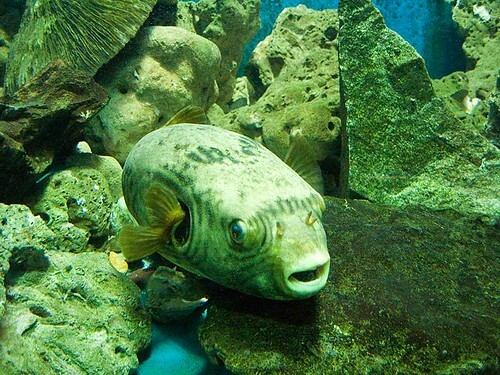 This is interesting…I didn’t know there was an aquarium in Penang! All I know was there was just a butterfly park….Is there a full address to this aquarium or a website? I would love to make a visit to check this place out. Thanks! Next post: A Square Where Great History Events Took Place!